It is a time of unrest in 1920s Europa. The ashes from the first great war still darken the snow. The capitalistic city-state known simply as "The Factory," which fueled the war with heavily armored mechs, has closed its doors, drawing the attention of several nearby countries. 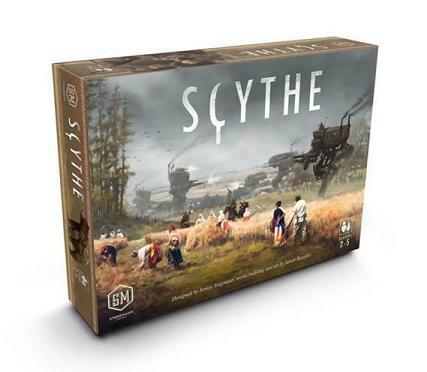 Scythe is a 4X board game set in a time of farming and war, broken hearts and rusted gears, innovation and valor. In Scythe, each player represents a character from one of five factions of Eastern Europa who are attempting to earn their fortune and claim their faction`s stake in the land around the mysterious Factory. Players conquer territory, enlist new recruits, reap resources, gain villagers, build structures, and activate monstrous mechs.